Sister Nivedita (1867-1911) is one of the most well-known disciples of Swami Vivekananda. She was born as Margaret Elizabeth Noble in Northern Ireland. After meeting Vivekananda in London in 1895, she accepted him as her spiritual master. Soon, she left England to serve India and reached Calcutta in January 1898. In March, Margaret was re-christened as ‘Nivedita’, meaning ‘the consecrated one’. Her life in India for the next 13 years (till she passed away in Darjeeling) was a saga of service and involvement in the Indian national cause in all its dimensions. The year 2017 marks the 150th birth anniversary of this great soul. 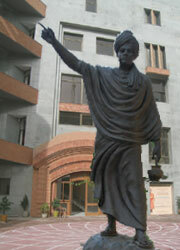 Nivedita is generally known as a social worker and educationist who worked especially for the education of Indian women. What is less-known about her is that she was one of the foremost figures of her times to promote the idea of writing Indian history from an Indian perspective. She interacted with almost all the important writers on Indian history of her time and exerted an influence in terms of sharing ideas as well as affording warm encouragement. She was a friend of Romesh Chunder Dutt (1848-1909), civil servant, prolific writer on aspects of Indian history and culture, and President of Indian National Congress in 1899. She greatly appreciated his works on Indian history and wrote his obituary when he passed away. Sir Jadunath Sarkar (1870-1958) also knew her in person and later recalled her as a “rare foreigner” who possessed “that sympathetic insight which only a native can possess” 1. Nivedita’s letter (dated 4 February 1906) to Radha Kumud Mookerji (1884-1964), another historian of repute and author of books like The Fundamental Unity of India, Indian Shipping and Ancient Indian Education, later became an essay titled ‘A Note on Historical Research’. This essay was meant to serve as a guideline for aspiring historians. She wrote many essays on different aspects of Indian history, which were later collected in a single volume titled Footfalls of Indian History. To write these essays, she travelled extensively to historical sites in India, and combined observation with deep insight. What is of greatest import are Nivedita’s ideas regarding how to understand, write and teach Indian history. A few salient features of the methodological innovation she proposed will be discussed here. Firstly, Nivedita said that India can only be understood in the light of Indian history. ‘The present is the wreckage of the past’; hence, if one has to understand the Indian civilization as it stands today, one has to delve into its past in order to chart the course of its development over time. At the same time, she pointed out that “India herself is the master document”2 which we have to read in order to know Indian history. She wrote, “The country is her own record. She is the history that we must learn to read.”3 Learning how to read India is an exercise that involves a specific method. Nivedita was one who wanted aspiring historians to decipher “the Indian idea of India”. For that, we require a method that will help us understand an Indian idea on its own terms and not with reference to parameters determined by non-Indian concepts. An important component of Nivedita’s historical thinking was her emphasis on geography and the history of place, especially the layered histories of ancient cities. She said that “History must be viewed geographically and geography historically”7. If geography be invoked to serve the cause of history, it would be easily discernible how a notion of territorial and civilizational identity—no matter how it was defined—was already present in pre-colonial India. It was a result of stable geographical boundaries, busy pilgrimage routes and destinations spread across the length and breadth of the country, vibrant ancient cities that acted as centres of culture, and great political empires. In other words, the unity of India was not a gift of British rule as many British imperialists liked to claim. 1. R. C. Majumdar and A. S. Altekar (eds. ), A New History of the Indian People, Moti Lal Banarsi Dass, Lahore, 1946, vol. 6, p. vi. 2. Sister Nivedita, ‘The History of India and Its Study’, in Footfalls of Indian History, Advaita Ashrama, Kolkata, 1915, p. 6. 6. Sister Nivedita, ‘A Note on Historical Research’, in Hints on National Education in India, Udbodhan Office, Kolkata, 1966, pp. 96-97; emphasis added. 7. Sister Nivedita, ‘The Future Education of the Indian Women’, in Hints on National Education in India, p. 59. 8. Footfalls of Indian History, p. 16; emphasis added. 10. Hints on National Education in India, p. 103. 11. Sister Nivedita, ‘Romesh Chandra Dutt’, in The Complete Works of Sister Nivedita, Sister Nivedita Girls’ School, Calcutta, 1955, vol. 5, pp. 262-63. 12. Hints on National Education in India, p. 98. 14. Footfalls of Indian History, p. 14. 15. Hints on National Education in India, p. 61. 16. Swami Vivekananda, ‘Reply to the Address of the Maharaja of Khetri’, in The Complete Works of Swami Vivekananda, Advaita Ashrama, Kolkata, 1989, vol. 4, p. 324. 17. Hints on National Education in India, p. 61. 18. Footfalls of Indian History, p. 96.